The SM-5000 is an advanced 2.4G wireless silent optical mouse which connects to your PC or laptop with it's super small nano receiver, double scroll wheel, DPI switch and superb comfortable design it's a must have mouse. The Nexus Silent Mouse has a comfortable size and is an excellent mouse for desktop use. But also for laptop users it is very suitable. Especially because of the small nano receive which you plug in a USB port and leave it there. It is so small that you do not need to take it out...you just forget its there. Furthermore the mouse is made from quality surface treatments so it feels good in your hand. 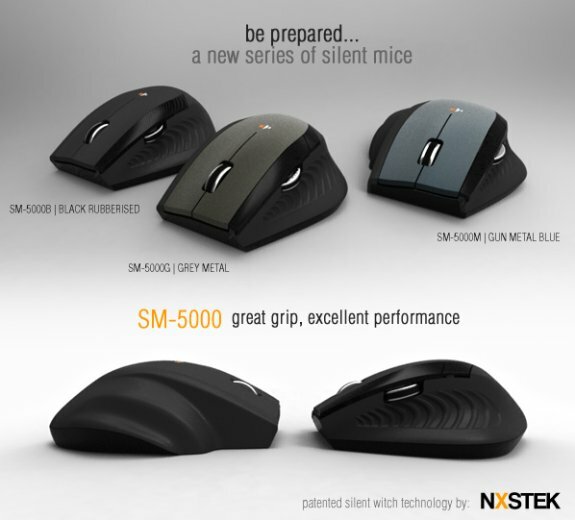 The switches we have used for the Silent Mouse have a patented construction and lack the "click" sound when you press them. You will be amazed how much more relaxing it is when you get rid of this useless sound in your working environment. The SM-5000 comes in three different colors, rubberized black, grey metallic and gun metal blue.